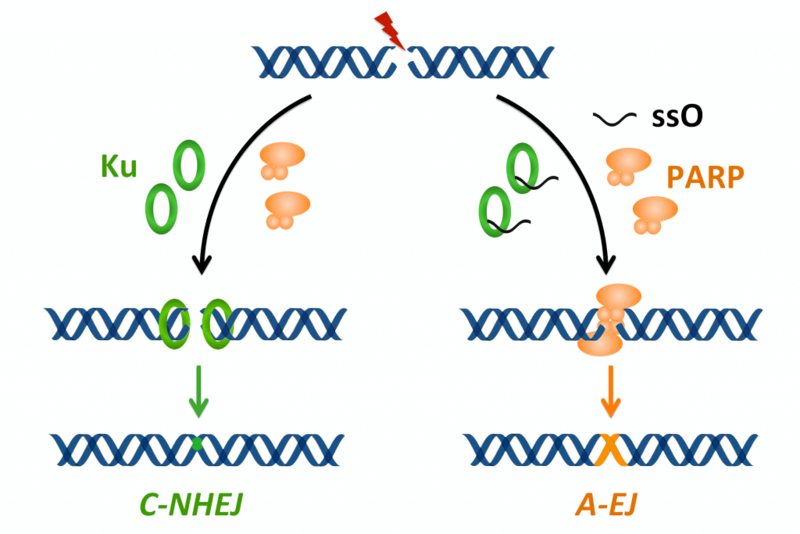 Balance between NHEJ and A-EJ: A-EJ works essentially in the absence of one or more of NHEJ proteins (Frit et al., 2014). Ku is a major suppressor of A-EJ by preventing access to DSBs (Cheng et al., 2011). An initial common step in A-EJ and HR repair is the degradation of a DNA strand from the ends of the DSBs by the so-called resection process. We have shown that single-stranded DNA oligonucleotides generated by resection impact the choice of the DSBs repair route through binding to Ku, blocking its DSB binding activity and thus activating A-EJ (Yuan et al. 2015). Choice between C-NHEJ and HR: Campthotecin (CPT), a topoisomerase I inhibitor (topoI) whose derivatives are used in cancer therapy, selectively induces in replicating cells specific DSBs, characterized by one single end and thus only repairable by HR. HR is initiated by DNA resection which forms a 3' single-stranded DNA tail. Ku blocks DSBs access to the exonuclease activities of resection. By using an original technique for imaging Ku foci at DSBs (Britton et al. 2013), we have demonstrated that Ku is very quickly eliminated from replicative one-ended CPT-induced DSBs to allow HR repair taking place. 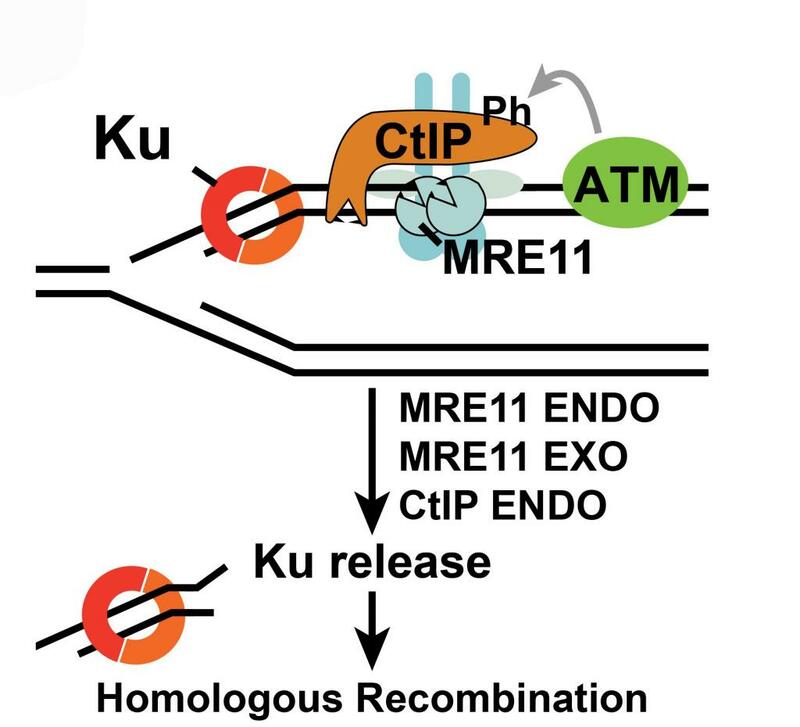 Coordination between the endonuclease and exonuclease activities of Mre11 and the endonuclease activity of CtIP ensures part of the Ku release of DSBs that allows HR to take place and block toxic NHEJ. Our results also revealed the existence of other as yet unknown activities that account for >50% of Ku's release from these DSBs (Chanut et al, 2016).